Many retiring baby boomers, who live in New England and Northern Atlantic states, are downsizing and choosing to move to warmer states like: Florida, North Carolina, South Carolina and Georgia. Often this process is complicated because there are years and years of accumulated household and personal items that need to be sorted. Decisions need to be made for storage and for transporting these items to other states. Finding all of the service providers can be a daunting task: Who can I trust, who do I call, what do I do first, are just some of many common questions. 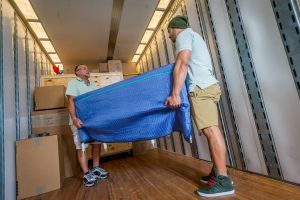 With over 100 years and over 50,000 satisfied homeowners, the William C Huff Moving and Storage Company has a well-established history of providing reliable services. This vast history and knowledge of the industry means the William C Huff Company can answer any questions that are related to moving and storage. Known as a “trusted advisor” to many seasoned homeowners who have moved to Sothern states, our clients know that just one call can take the worry out of moving. Our tenured office staff are poised and ready to recommend all of the related services that result in a downsize move. Home organizers, roll-off dumpsters (yes…”when in doubt…throw it out”), charities, consignment services, appraisers, auctioneers, car transporters and freight forwarders are some of the many vetted service providers we can recommend to downsizing homeowners who are relocating along the East Coast. And, then there’s the moving and storage itself. There is no other company on the East Coast who provides premier moving and storage. Every client’s needs are handled personally by our client liaisons and all the details are articulated to the highly tenured and trained moving staff. The result is seamless, stress-free moving from beginning to end.